The volunteer would complain, of course. I suppose he couldn't help it. He felt angry or self-righteous or betrayed. He said this was not what he'd signed up for, this was breaking a promise, breaking the rules, this was not the way the good guys conducted themselves. He might say this was a violation of his human rights, a war crime, a crime anyway. And I'd say, "You're probably right," and then continued with the process. Joe's got a lot to think about, and time on his hands to do it, since divorcing his wife and quitting his job training volunteers for a shadowy government agency. The otherwise nondescript house he's just moved into boasts one key feature: a circular path in an overgrown backyard, on which Joe plans to walk twenty-five miles a day for a thousand days. Joe figures that walking the circumference of the Earth--safely on his own patch of territory --might just be the thing he needs to move on with his life. But curious neighbors keep sharing their troubles and preoccupations, looping Joe into mundane intrigues, and unwittingly triggering Joe to use the unique problem-solving skills he learned on his old job. With the help of an aspiring bartender, who tests her experimental cocktail recipes as he walks, and philosophical advice from his mailman, Joe stays on pace despite the distractions. But it doesn't matter how quickly he walks, the past is catching up to Joe, and for the first time, he must prepare himself (and not others) for the worst. 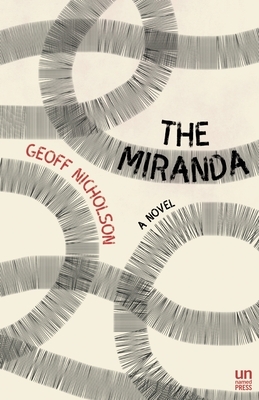 A brilliant novel by a master storyteller, The Miranda is at turns a biting satire about the secrets we keep from our neighbors, and about the invisible and unceasing state of war in which most Westerners unconsciously live. Geoff Nicholson is the acclaimed author of The City Under the Skin, Bleeding London, Bedlam Burning, and the cult classic Footsucker, among many others. His journalism has appeared in many periodicals as varied as GQ, The New York Times, Bookforum, Art Review, the London Daily Telegraph, the Guardian, and McSweeney's. The Miranda is his most recent novel.